U.S. Central Command (CENTCOM) Joint Theater Support Contracting Command ethics training presentation from May 2012. FOUO CENTCOM Engineering Contingency Construction Overview, August 2010. (U) Purpose. This Concept of Operations (CONOP) documents concepts and procedures for the use of biometric technologies to support identity superiority, protection and management in the entire USCENTCOM AOR. This CONOP focuses on the biometrics process and key systemic enablers. This CONOP contains UNCLASSIFIED and CLASSIFIED 100 annexes. The body of the CONOP is UNCLASSIFIED however, Annex E, “HUMINT Biometrics Management”, is CLASSIFIED SECRET//NOFORN. 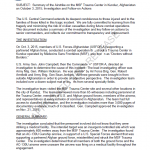 FOUO U.S. Central Command “Monitoring the Tactical Network” Brief, April 13, 2010.